You can have your website in multiple languages by adding languages to your website and translating the pages. In the "System" perspective, select "Languages". On the toolbar, click "Add Language". In the "Add Language" window, select a language. The languages will be added to the dropdown list in the bottom right corner of the Administrative console. In the bottom right corner of the console, select the language you want to translate pages to. Click "OK" in the "Cleanup Required" popup window. In the Content perspective, select the topmost non-translated page (e.g. the homepage). On the toolbar, click "Translate Page". 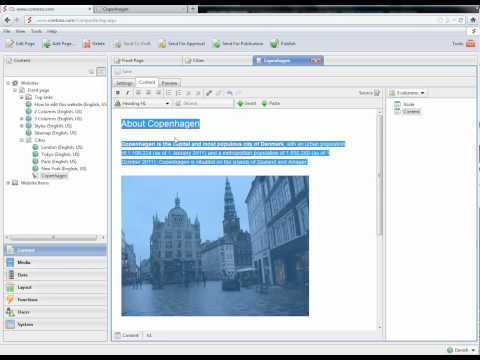 The page will open in the page content editor. Once you have added another language to your website, you can translate its pages.